I decided to try out for Robyn's (My Pink Stamper) Design Team. Many of you may share this same story, but it was Robyn who actually introduced me to the Cricut and to this terrific Blogger world. 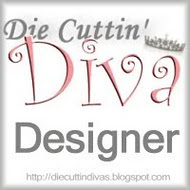 I found her site last summer, and admit that I am now totally addicted to everything Cricut and to blogging. I've met so many talented and friendly blogger buddies willing to share their creations and knowledge. Robyn will be choosing a handful of people to serve 6 months on her upcoming team! To apply for the Design Team, you need to post a project for this challenge by 11:59 pm CST tonight. There are several requirements that you need to meet like posting to your blog regularly for at least 3 months; not serving on other DTs that sell product that is similar to her stamps (don't you just love them?! ); and making a project specifically for this challenge. I haven't been on a Design Team, this would be my first, and I meet all the other "minimum" requirements. The challenge is to make a card, scrapbook page, or other Cricut project with your favorite Cricut cartridge using the following colors......Orange, Turquoise, Green, Brown, (other optional color of your choice). I wanted to make a shape card and use an MPS stamp, and I stayed with the four main colors. Here's what I made. Card is cut from Wrap It Up cartridge at 6", using the Card feature, and several different layers. Butterfly is cut from the Birthday Cakes cart at 1-1/4" with layer. Orange patterned paper is DCWV Amber Autumn matstack; other solids are from my stash. Embossed the brown cardstock with Cuttlebug Tiny Mosaic embossing folder. All the stamps are from Robyn's Bunny Punnies set, stamped with Memories Chestnut ink. Also inked up all the edges. Inside sentiment typed from computer and I rounded the corners on the paper. Super cute! Love the book idea and the colors turned out perfect! Good Luck Pat - Your card is really neat - I love the unique shape and creative use of Robyn's stamps! Great job! This is fantastic Pat! Good Luck. This is incredible!! I love how you used Robyn's stamps on the book bindings! Good luck!! Very creative. I really like this card. My DH loves to read books and I am always looking for something different to use to make him a card. Thanks for the inspiration. So sweet Pat! Great project! Good luck my friend! I love your card! Good luck with the DT. Such a kute kard...good luck...just became a follower...hope you do the same. Wow Pat, this card is awesome ! Good Luck with the DT! I just love the books you used and the colors. I had no idea that cartridge had the books on it. Congrats on a great project! Hope you make the team! I tried out too, but so far I've heard nothing. I think I'm already one of your followers. Oh my! How cute! That was the perfect embossing folder to use! Best Wishes! I am becoming a follower. OMGoodness! What an awesome card! Fantastic card Pat! Love it! The colors, embossing, and stamps are great! Good luck! Soooo super cute! Thanks for submitting! Congratulations on your honorable mention for the MPS DT challenge. Congrats on honorable mention, project was cute, maybe next time! I loved this card the moment I saw it! Congratulations on your Honorable Mention! Your card is a-dorable!! I love how you used the stamps. So creative!! Congrats on the honorable mention. You do great work. Wow! What a cute idea!! Love the card! Congrats on your Honorable Mention!! Winner from the Christmas in July Blog Hop! Honorable Mention from My Pink Stamper! I Made an Easel Card!